An ILS Proton M rocket carrying the ArabSat 4A satellite is raised into launch position at Baikonur Cosmodrome, Kazakhstan. ARussian-made rocket booster malfunctioned during launch Tuesday, leaving an Arabtelecommunications satellite below its intended Earth orbit and dealing a harshblow to the commercial space industry. The Proton M rocket roaredoff pad 39 at the Baikonur Cosmodrome in Kazakhstan at 2010 GMT (3:10 p.m. EST)carrying the ARABSAT 4A spacecraft. The commercial mission was managed byInternational Launch Services, the joint U.S.-Russian firm that markets Protonand American Atlas rockets. About 10 minutes into theflight, the three lower stages of the Proton had completed their systematicfirings and dropped away as planned. That left the Khrunichev-built Breeze Mupper stage and attached satellite payload flying an initial suborbital trajectory. The Breeze M's main engineignited a few moments later to ascend into a 108-mile (173-kilometer) high parking orbit. ILSreported that the burn had occurred as scheduled, ending at T+plus 14 minutes,45 seconds. Three more engine firingswere planned by the Breeze M over the next three-and-a-half hours to propel the7,366-pound 3,341 (kilogram) satellite to geosynchronous transfer orbit. Therocket was slated to remain in that parking orbit for 50 minutes, coastingacross the Pacific and lower tip of South America before the next criticalengine burn was expected, beginning at 2115 GMT (4:15 p.m. EST) and lasting 21minutes. A minute after the burn's conclusion, the Breeze M would jettison itsemptied Additional Propellant Tank -- a donut-shaped structure surrounding thestage's main body. The engine would then re-start at 2148 GMT (4:48 p.m. EST)for a three-minute burn. The back-to-back burns wereanticipated to produce an orbit with a high point of 22,236 miles (35,785 kilometers), low point of538 miles (865 kilometers) and inclination of 51.5 degrees to the equator. Had the mission been goingaccording to plan, Breeze should have coasted in that orbit until 2349 GMT(6:49 p.m. EST) when a nearly eight-minute engine burn was designed to raisethe low point upward to 1,957 miles (3,149 kilometers) and greatly reduce the inclination to 14.2degrees. ARABSAT 4A was expecting to be released from the rocket motor atT+plus 4 hours to complete the launch. "Preliminary flightinformation indicates that the Breeze M upper stage shut down early during itsplanned burn sequence," ILS said in its failure announcement. "As acontingency, the satellite was separated. We cannot comment on the dispositionof the spacecraft at this time." ARABSAT 4A carried enoughfuel for its on-board propulsion system to maneuver the spacecraft to its finaldestination from the geosynchronous transfer orbit that the Proton rocket wastargeting. Those maneuvers would circularize the orbit at 22,300 miles (35,888 kilometers) andreduce inclination down to the equator, reaching a geostationary orbit wherethe craft would match Earth's rotation and appear fixed over one location -- 26degrees East longitude. But a Breeze M failure inthe midst of the complicated launch sequence likely strands ARABSAT 4A in auseless orbit with little hope of overcoming the mishap. The amount of fuelthat would be required to cover missing altitude and inclination changes fromthe botched launch, plus the travels to achieve geostationary orbit, probablymeans the satellite cannot save itself. The craft's current orbit,however, was not disclosed by ILS. The actual orbit the satellite is flying inwill determine the chances of salvaging ARABSAT 4A. TheEuropean firm EADS Astrium built the satellite based on the Eurostar E2000+design. It is equipped with 24 C-band transponders and 20 Ku-band transpondersas part of a communications package made by Alcatel Alenia Space. ARABSAT 4A is the first ina new generation of spacecraft for the Arab Satellite CommunicationsOrganization of Riyadh, Saudi Arabia. The satellite would have provided directbroadcast television, data relay, Internet and telephony services across the MiddleEast, North Africa and Western Europe. EADS Astrium is in thefinal assembly phase of readying the ARABSAT 4B spacecraft for launch laterthis year. That mission is scheduled to ride a Proton/Breeze M vehicle, too. Tuesday's failure was thethird in 36 launches of ILS Protons since commercial missions began in 1996.The two earlier mishaps -- in 1997 and 2002 -- involved Block DM upper stages,which ILS no longer actively markets for its Proton launches. Ten previous ILS launchesusing the newer Breeze M had been successful since December 2002. It is too soon to know theimpact this failure will have on the year's Proton launch schedule. The nextflight had been targeted for the end of April with the Hot Bird 8communications satellite for European operator Eutelsat. "A Russian StateCommission is being formed to determine the reasons for the anomaly. Inparallel with the State Commission, ILS will form its own Failure ReviewOversight Board to review reasons for the anomaly and define a corrective actionplan," ILS said in tonight's announcement. "ILS remains committedto providing reliable, timely launch services for all its customers. 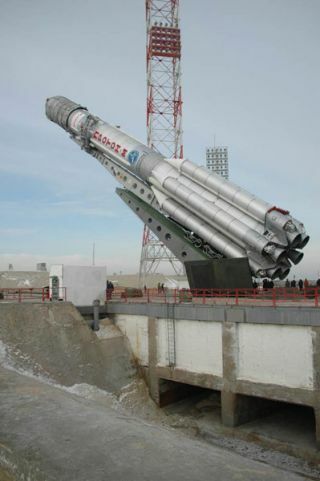 To thisend, ILS will work diligently with its partner Khrunichev to return Proton toflight as soon as possible." Meanwhile,ILS' other rocket -- the Lockheed Martin Atlas -- has a remarkable record of 78consecutive successful launches dating back to 1993. An Atlas 5 dispatched the firstrobotic probe to visit the unexplored planet Pluto last month, and the rocket'snext launch is targeted for April 20 from Cape Canaveral.